One afternoon in mid-July of 1915, several thousand people standing on San Francisco’s blustery Marina Green collectively craned their necks to watch aviator Art Smith pilot his hand-built craft through a series of aerobatic stunts overhead. For many, this was the first time they’d ever seen an airplane fly. Some held their breath as Smith’s machine rolled and looped above the stately complex of ivory palaces accented with luminous colors and cut-glass jewels that stood at the verge of the sparkling silver-blue bay: the Panama-Pacific International Exposition (PPIE). Overview: What Was the PPIE? In 1904, when city leaders first envisioned San Francisco as host of a grand international exposition commemorating the completion of the Panama Canal, could they have imagined a 635-acre "city within a city" arising out of the ashes of a devastating earthquake and fire? Could they have predicted—just a decade later at the outbreak of World War I—the astonishing success of this world’s fair? The story of the 1915 Panama-Pacific International Exposition is a tale of vision and imagination, perseverance and fortitude, talent and ingenuity that captivated a city, a state, the nation, and the world on the cusp of momentous globalization, innovation, and creativity. Revisiting it today, we recognize our achievements as well as our dreams. In the crowd, a child might be standing shoulder to shoulder with an actual gold rush forty-niner, a Civil War veteran, or a survivor of the Donner Party. And that same child would be transfixed by the images on her home television set sixty-four years later as she watched a man walk on the moon. The span of history witnessed by visitors to the 1915 Exposition reveals an era of astounding change. An examination of this event—perhaps the last in the original era of great world’s fairs—offers a kaleidoscope of culture and progress. The Exposition’s highs and lows echo into the twenty-first century. The story of the PPIE, officially nicknamed the "Jewel City," began more than two decades before it opened, and surprisingly gained momentum following the Great Earthquake and Fire of 1906. San Francisco leaders’ first thought, as they surveyed the nearly four square miles of shattered masonry and charred wood left by the disaster, was to rebuild. Their second thought was to throw a giant celebration and invite the world to come. Perhaps a judicious course would have been to delay or cancel the world’s fair the city had contemplated since 1891, but San Francisco—steep, brash, wayward San Francisco—was never known for its prudence. In name, the celebration would commemorate the United States’ completion of the Panama Canal. More importantly to the city, and to California, it was intended to replace in the eyes of the world the image of a destroyed San Francisco. Organizers hoped the international exposition would increase tourism, settlement, and investment, and spur development and cement the Golden State as a trade gateway between Europe and Asia through the newly opened waterway. The city’s audacity was rewarded when the subsequent years of intense labor culminated in the triumphant 1915 opening of the Panama-Pacific International Exposition. "Just think of what they have done!" said Current Opinion magazine. "San Francisco nine years ago was in ruins. To-day it is rebuilt; and…they have brought into being at the same time this superb International Exposition…." The PPIE aspired to present no less than "a microcosm so nearly complete that if all the world were destroyed except the 635 acres of land within the Exposition gates, the material basis of the life of today could have been reproduced from the exemplifications of the arts, inventions and industries there exhibited," stated the Fair’s official history. Essentially, the Exposition attempted to "curate the planet," a concept that seems grandiose and naïve by modern standards, yet was magnificent in its aspiration. "It was intended to replace in the eyes of the world the image of a destroyed San Francisco." This Fair provides a lens through which to view the discoveries, celebrities, politics, arts, and zeitgeist of the era. Visitors could watch the assembly of a pair of Levi’s jeans or a brand new Ford, take in an avant-garde art display or listen to a speech by Teddy Roosevelt. They could see a temple molded entirely from soap or a tiny rosebush made of gems—or butter. When tired of riding around a six-acre replica Grand Canyon or a five-acre model of the Panama Canal, attendees could ascend nearly three hundred feet into the sky in a "house" attached to a steel arm. If the midway did not attract, they could enjoy a daily rotation of bands, parades, pageants, and headlining entertainers, including bandmaster John Philip Sousa, renowned composer Camille Saint-Saëns, and flamboyant dancer La Loïe Fuller. Even as the PPIE strove to present the finest of mankind’s products and achievements—a "comprehensive and representative contemporary record of the progress and condition of the human race," according to its director of exhibits—the Exposition also unintentionally exposed the evils of the era. Prurient shows and racist material were on display adjacent to booths offering delicacies, handicrafts, or the latest technologies. Radium, touted during the Fair as a source of bountiful clean power, eventually was proven lethal. The Palace of Education and Social Economy presented public health programs designed to improve quality of life around the world, but at least one ideology—eugenics—promoted what are now widely considered human rights abuses. And overshadowing every aspect of the PPIE was the Great War then engulfing half the globe. With its moments of sublimity and iniquity, the PPIE also represented a tremendous enterprise, the collaboration of tens of thousands of individuals, many of whom were otherwise foes, who worked in concert toward a greater goal. As US vice president Thomas Marshall said during his dedicatory visit to the Fair: "A people dies when it loses its vision, when it ceases to dream its dream, and when from its loins there come forth no more pioneers or pathfinders." Exploring the wonders of the Panama-Pacific International Exposition allows us to celebrate the dreamers, pioneers, and pathfinders of that era, and to draw parallels with the visionaries of our own epoch. 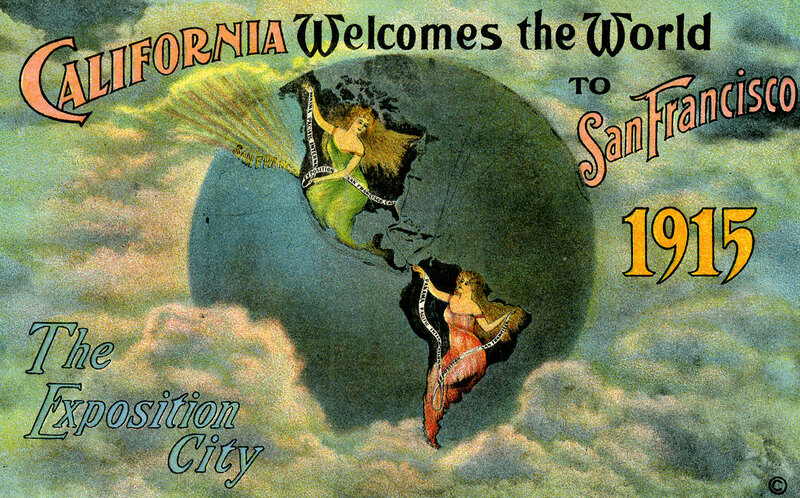 "An Introduction to the Panama-Pacific International Exposition," excerpted from San Francisco’s Jewel City: the Panama-Pacific International Exposition, © 2015 by Laura A. Ackley, all rights reserved. Copyright 1915 by Chas. Weidner, San Francisco, Cal. Less than half a century before the fair opened, San Francisco had transformed itself from a small frontier town to a bustling city boasting the most active mint in the nation. 2 Drawing, perhaps, on this past success, civic leaders rose to the challenge to create a new identity for a city ravaged by natural disaster—a cultural and economic hub capable of playing a major role in regional, national, and international affairs. From the first proposal in 1904 to erect a commemorative fair in San Francisco, local businessmen were undaunted in their pursuit to acquire the necessary funds. Of the nearly $50 million it cost to build the fair, the city and state gave approximately $17.5 million. Concessionaires and exhibitors accounted for the rest. 3 Fair planners matched this optimism. Although three sites were originally intended to house the fairgrounds, the planners selected Harbor View, a marshy section of the city’s northern shore known today as the Marina District. In just three years, laborers cleared the area of structures and debris and filled the mud flats with sand dredged from the bay. Though the excavation did not match that of the Panama Canal in scope and complexity, the fair’s boosters drew parallels with the Herculean efforts to build the canal. Perham Nahl’s image of a muscular Hercules parting the continents to form the canal appeared on the cover of the official guide book and as a poster. Nahl titled his lithograph The Thirteenth Labor of Hercules, a reference to the canal itself, more than fifty years in the making. The city even confronted the global effects of World War I and local strife from political scandal, labor unrest, and prevailing biases of race, gender, and class while hosting the fair—a grand citadel of eleven exhibition palaces, twenty-one foreign pavilions, forty-eight state buildings, and a 65-acre amusement zone. Indeed, the fairground was a mini-metropolis of inspirational architecture and design, destined, like all world’s fairs, for eventual demolition. But so compelling was its effect on visitors that preservation efforts began before the fair even closed. Organizations such as the Exposition Preservation League, led by Phoebe Apperson Hearst, honorary president of the exposition’s Woman’s Board, saved some of the fair’s artifacts from demolition. "In its technological, artistic, and architectural innovations, the PPIE offered fairgoers an experience unlike their encounters at past world’s fairs." Among its many attractions, the fair boasted the world’s largest wood and steel building (the Palace of Machinery), the largest state building (the California Building), a juried exhibition described as the nation’s best modern art collection (the Palace of Fine Arts), the first transcontinental telephone call (made by Alexander Graham Bell to the fairgrounds before the fair opened), and indirect lighting for outdoor effects used for the first time at an exposition. Complementing the spectacular illuminations were "jewels" of polished crystal and colored glass accentuating architectural features, most visibly on the 43-stories-tall Tower of Jewels, giving the fair its nickname, the Jewel City. Almost 19 million fairgoers found inspiration, education, and amusement in the ten months of the fair’s duration—about 450,000 attending on closing day. 6 If we could see the fair through their eyes, collectively and individually, what might we learn and understand about our urban centers today? Shelly Kale is manager of publications and strategic projects at the California Historical Society. She is a contributor to and former managing editor of California History journal. 1 Frank Morton Todd, The Story of the Exposition: Being the Official History of the International Celebration held at San Francisco in 1915 to Commemorate the Discovery of the Pacific Ocean and the Construction of the Panama Canal, 5 vols. (New York: G.P. Putnam’s Sons/The Knickerbocker Press, 1921), xv–xvi. 2 By 1877, the mint was producing over fifty million dollars in coins; "The Old Mint," http://www.theoldmint.org/. 3 Laura A. Ackley, San Francisco’s Jewel City (Berkeley, CA: Heyday, 2014), 350. 4 Gray Brechin, "Sailing to Byzantium: The Architecture of the Fair," in The Anthropology of World’s Fairs: San Francisco’s Panama Pacific International Exposition of 1915, ed. Burton Benedict (London and Berkeley: Lowie Museum of Anthropology in association with Scholar Press, 1983), 97–103. 5 Bernard Maybeck, Palace of Fine Arts and Lagoon: Panama-Pacific International Exposition, 1915 (San Francisco: Paul Elder and Company, 1915), 9. 6 Ackley, San Francisco’s Jewel City, 343. On this day in 1915 the Liberty Bell Arrived in San Francisco following a cross-country trip from Philadelphia. 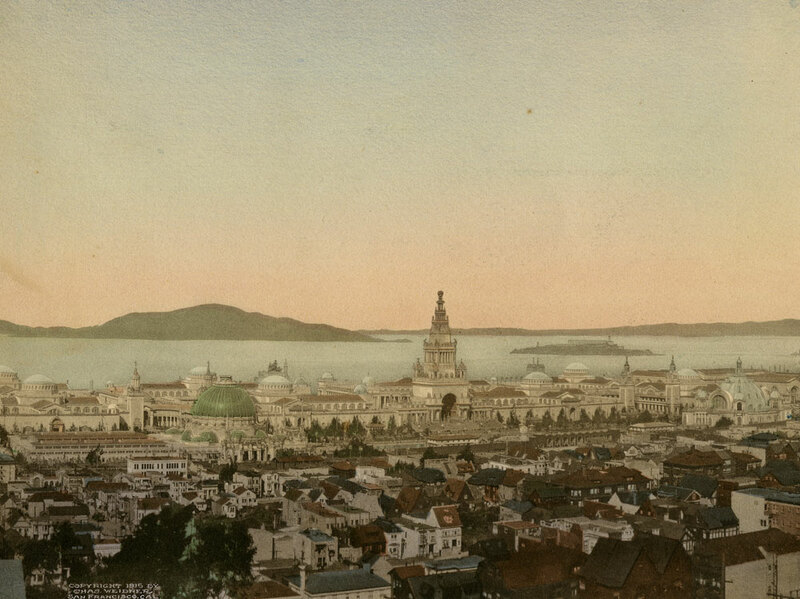 The following essay is excerpted with permission from Laura Ackley’s San Francisco’s Jewel City: The Panama-Pacific International Exposition of 1915.